National Testing Services specially known as (NTS). NTS offers different test structure for students from different educational back grounds. NTS provide best opportunity for students to appear in one test which is acceptable in many well-known universities of Pakistan. 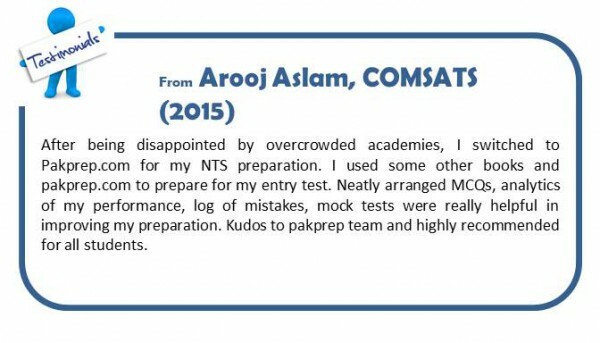 NTS test is comparatively very easy as compare to ECAT, MCAT, NUST NET, ETEA or GIKI entry test. Students can easily score good percentage to secure admission in reputed institutes of Pakistan affiliated with NTS. NTS has different test structure for Engineering, Medical and Computer science groups. NTS test for undergraduate admissions is known as NAT (National Aptitude Test).NTS conduct its National Aptitude Test (NAT) test many times in a year and its validity is for one year so students can take test any time they want. Main focus of NTS (NAT) test is on Analytical, English and Quantitative MCQ’s. Pakprep.com provides complete material for the preparation of NTS (NAT) test. Click here to start your preparation. This entry was posted in NTS, NTS NAT and tagged Best way to prepare for NTS, Download NTS Past Papers, Electrical Engineering admission requirements, How to Download NTS form, How to prepare for NTS, Important NTS MCQs, NAT for computer Science, NAT for Pre-Engineering, NAT for Pre-Medical, NAT-IM test pattern, NAT_IE test pattern, NTS, NTS affiliated Universities, NTS Biology MCQ's, NTS Chemistry, NTS Chemistry MCQ's, NTS Chemistry MCQ's Preparation, NTS Computer Science, NTS Engineering, NTS Engineering TEST, NTS Engineering test pattern, NTS English, NTS English MCQ's, NTS English MCQ's Preparation, NTS Entrance Test, NTS Entry Test, nts fee, NTS ICS, NTS IE, NTS IM, NTS Intelligence MCQ's, NTS Intelligence MCQ's Preparation, NTS Maths MCQ's Preparation, NTS MCQs, NTS MCQs solved, NTS Medical, NTs Medical Test, NTS medical test pattern, NTS NAT Preparation, NTS NAT-IE, NTS NAT-IM, NTS old papers, NTS ols paper, NTS Pakistan, NTS Past Papers, NTS Physics, NTS Physics MCQ's, NTS Physics MCQ's Preparation, NTS Preparation Online, NTS Quantatative MCQ's Preparation, NTS Quantitative MCQ's, NTS SOLVED MCQS, NTS test, NTS Test Pattern, What is NTS, What is NTS Entry Test on March 30, 2017 by Pakprep.com Admin. NTS stands for National Testing Service. NTS is the largest testing platform in Pakistan. It provides equal opportunity of admission in many Engineering universities to all those who apply for it and due to its authenticity many well-known universities accepts their results and give admission to students on the base of NTS result. The test which NTS took is called NAT (National Aptitude Test), which is a difficult test. Pakprep.com is one of the top entry test preparation website of Pakistan. We have all the material and up to dated pattern of NAT which will help you a lot in test. So if you want to score good marks in test you should visit Pakprep.com start preparing. Click Here to start your preparation. This entry was posted in NTS, NTS NAT and tagged Best way to prepare for NTS, Download NTS Past Papers, Electrical Engineering admission requirements, How to Download NTS form, How to prepare for NTS, Important NTS MCQs, NTS, NTS affiliated Universities, NTS Biology, NTS Biology MCQ's, NTS Chemistry, NTS Chemistry MCQ's, NTS Chemistry MCQ's Preparation, NTS Computer Science, NTS Engineering, NTS Engineering TEST, NTS Engineering test pattern, NTS English, NTS English MCQ's, NTS English MCQ's Preparation, NTS Entrance Test, NTS Entry Test, nts fee, NTS ICS, NTS IE, NTS IM, NTS Intelligence MCQ's, NTS Intelligence MCQ's Preparation, NTS Maths MCQ's Preparation, NTS MCQs, NTS MCQs solved, NTS Medical, NTs Medical Test, NTS medical test pattern, NTS NAT Preparation, NTS old papers, NTS ols paper, NTS Pakistan, NTS Past Papers, NTS Physics, NTS Physics MCQ's, NTS Physics MCQ's Preparation, NTS preparation, NTS Preparation Online, NTS Quantatative MCQ's Preparation, NTS Quantitative MCQ's, NTS SOLVED MCQS, NTS Solved paper, nts solved papers, NTS test, NTS Test Pattern, online preparation for NTS test, Quantitative MCQs, Quantitative MCQs preparation, Solved Quantitative MCQ's, What is NTS, What is NTS Entry Test on March 20, 2017 by Pakprep.com Admin. What is NTS Entrance Test? NTS entrance test is required for admission in most of the universities in Pakistan. Top ranked universities like NUST, GIKI, UET, NED, Punjab Medical Colleges, Punjab University, KPK Medical Colleges, ETEA, Sindh Medical colleges conduct their own test. NTS takes entrance test mostly private universities or second tier of public universities in Pakistan (with a few exceptions). This entry was posted in NTS, NTS NAT and tagged Download NTS Past Papers, How to prepare for NTS, Important NTS MCQs, NTS Entrance Test, NTS Entry Test, NTS IE, NTS IM, NTS MCQs, NTS Past Papers, NTS SOLVED MCQS, NTS Test Pattern, What is NTS, What is NTS Entry Test on March 13, 2017 by Pakprep.com Admin.